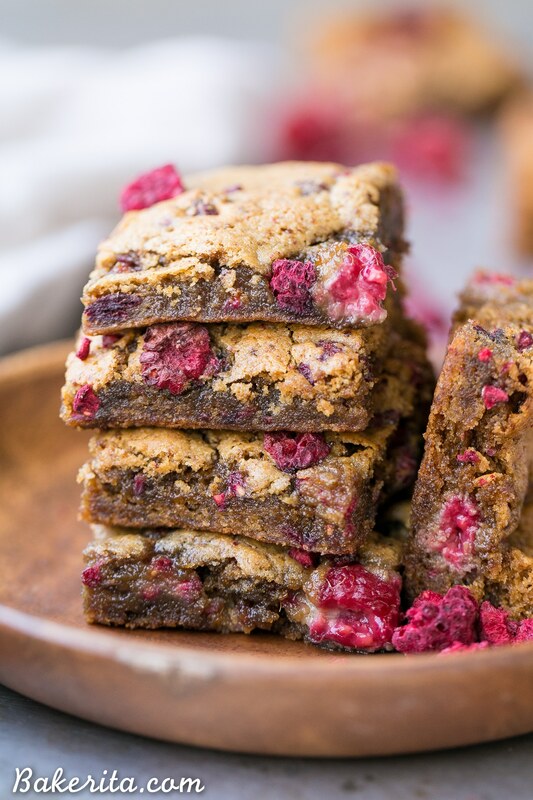 These Raspberry Blondies are incredibly soft and chewy and full of bright berry flavor. 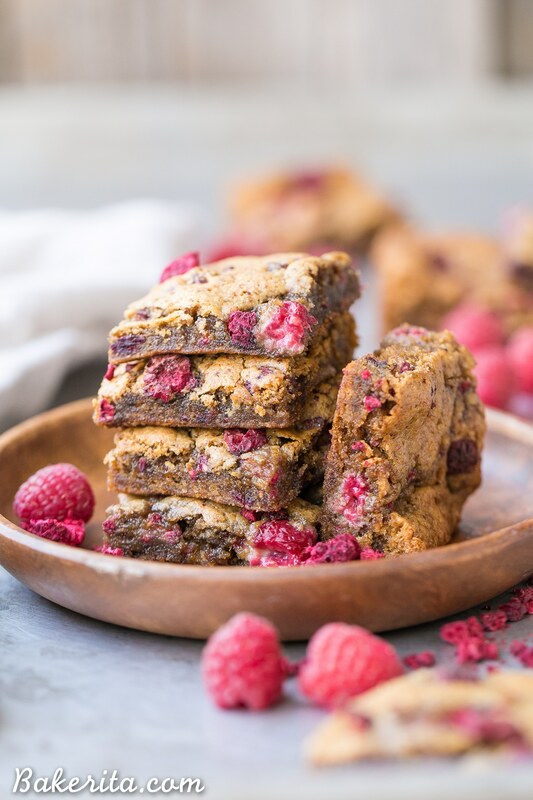 These gluten-free, Paleo and vegan blondies are made with cashew butter, coconut flour, and fresh raspberries! Alright, this recipe has been a long time coming and I blame only myself for you guys not having them sooner: the photos have been sitting in my Lightroom folder, unedited, for over a month or two now. I’ve tested this recipe a number of times, and each time I photographed them, and EACH TIME the photos didn’t come out the way I wanted. Finally, the other day, I started editing a few of them to see if they were salvageable. 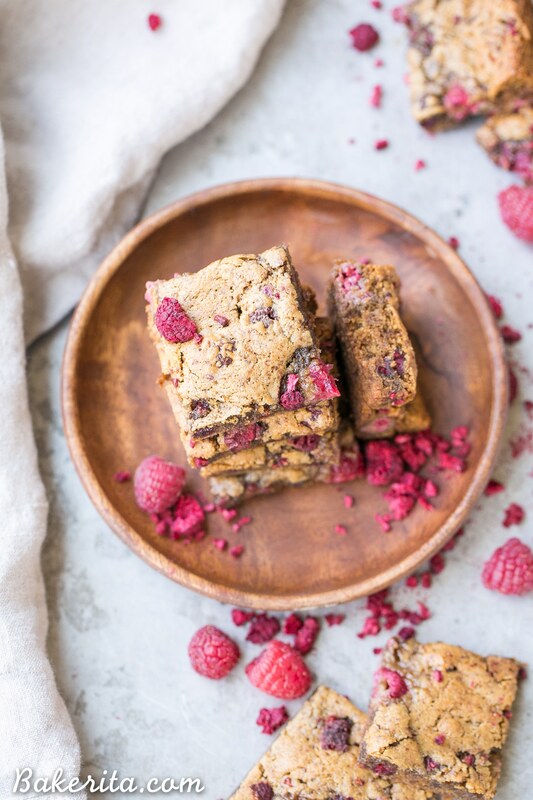 Although they’re not exactly what I wanted and the photos aren’t some of my faves, they’re acceptable enough to share with you, especially since these raspberry blondies are so. dang. good. Sometimes recipe tests go into the freezer, and are promptly forgot about…not these. These were snuck from the freezer and demolished by both Jesse and I, because they’re sooo rich, and chewy, with a bright burst of raspberry flavor. If I do say so myself, they’re pretty darn irresistible. I wanted to add chocolate chunks to these, but I held back, wanting to share a chocolate-free recipe with you guys for once. 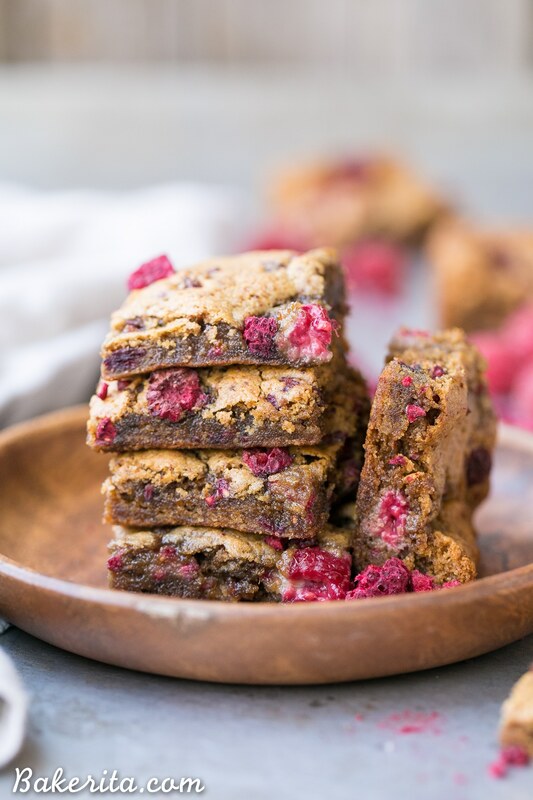 In the end, while the chocolate would have been delicious, the simplicity of these blondies allows the raspberry flavor to really shine. It also serves to highlight the fantastically chewy, rich texture that the cashew butter helps to create. Unlike my Paleo Chocolate Chunk Blondies, these use coconut flour instead of almond flour. I love the way the coconut flour acts in these blondies, but I did provide an almond flour option in the notes if that’s what you have on hand or prefer. I tested these blondies both with an egg and a flax egg, and both options were incredibly delicious – the flax egg version was maybe the slightest bit softer, but they were still awesome. I also included a nut-free option, by replacing the cashew butter with a nut-free butter like sunflower seed butter or tahini. You could also sub in the berries for your favorite, or use a combo of berries, but I’m personally partial to the cashew/raspberry combo. The cashew butter brings that inherent rich sweetness that cashews have which pairs so wonderfully with the bright, tart raspberries. In a bowl, whisk together the cashew butter, coconut oil, coconut sugar, egg (or flax egg), and vanilla extract until smooth and combined. Stir in the coconut flour, baking soda, and salt. Fold in the raspberries. Store in an airtight container at room temperature or in the refrigerator; freeze for long-term storage. If you don't have coconut flour, you can use 1 cup blanched almond flour instead. Alternatively, if you're avoiding nuts, you can use tahini or sunflower seed butter in place of the cashew butter to keep it nut-free. Rachel!!!! These look amazing! And the photos still turned out great :) I love that combo of cashew butter and raspberries – so good! Thanks so much Lucia! The cashew butter adds such a nice buttery richness – it’s the best! Giiiiirl! It’s so funny how we can be our own worst critic – these photos look amazing! I’m watering at the mouth to the extent that I feel like I need to drop everything and bake them! I also have all the ingredients on hand, so this could be one of those dessert-for-all-the-meals days ;) Bravo, sister! Man do these look fabulous! Perfect use for the last of summer’s berries! Rachel, these blondies are pretty much spot-on PERFECTION! 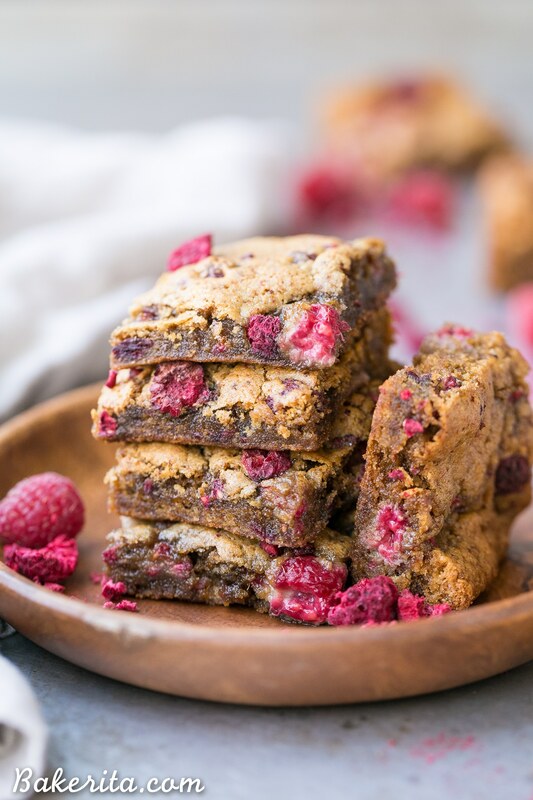 I never would have thought of adding raspberries to blondies and that’s pretty much the best idea ever. These look SO insanely chewy! I love your photos! Going to give these a go now it’s berry season in Australia! Thanks so much Shanai! Hope you love them. It looks like there are freeze dried raspberries in the photo and the Blondies. The recipe calls for fresh. Could you elaborate on that? Freeze dried would make it easier when Fresh can’t be found in the store. Hi Karl, I did put a few freeze dried raspberries on top of the blondies for the photos, but I didn’t love the texture they took on after they were baked and cooled. You certainly could use them, but I preferred the fresh raspberries, which is why I called for them in the recipe. Hi, what about frozen raspberries? I would lile to try the recipe but I only have frozen raspberries. Would they still work as desired in this recipe please? I have some fresh raspberries that I picked from the garden and froze or supermarket frozen raspberries. Also, should I defrost before using in recipe? Thank you. I would stick with fresh for these, as the added liquid from frozen berries might make them a little bit too mushy. If you were going to use frozen, defrost and drain as well as you can before using – no guarantees it’ll turn out right though, since I’ve only had good results with fresh berries. I tried to make them with frozen raspberrys today. And I drained them as well as I could, but when I baked them the berrys still lost a lot of liquid that burned on the surface. They still taste pretty good, but they look horrible. Hi Amelie, that’s why I recommend making these with fresh raspberries – frozen just adds too much liquid!! Glad they still tasted good though. Any alternative for cocunut sugar? You could use any granulated sweetener, I’ve only tested with coconut sugar though! I switched the cashew butter for almond butter as it was all i had in the cupboards, but oh my god these are soooo good! The smell from the mix pre baking made me want to eat them straight away! But it was so worth the wait!